"The A Team - headed to the White House!" Rob Goldstone wrote on the night of Trump's election victory. Over the weekend, Goldstone — who represents the musician son of a billionaire in Russia — said he helped arrange a June 2016 meeting between the president's son and a Russian lawyer who had been working to change US policy. Over the weekend, the New York Times reported that a meeting had taken place in June 2016 between a Russian lawyer with connections to the Kremlin and Donald Trump Jr., Jared Kushner, and Paul Manafort — key figures in the Trump Organization and Donald Trump's presidential campaign. Trump Jr. initially told the New York Times on Saturday that the conversation with Natalia Veselnitskaya was focused on "a program about the adoption of Russian children." In a second story, the Times reported that Trump Jr. "was promised damaging information about Hillary Clinton" as part of the meeting. Much of what actually happened in the meeting is still unclear. The adoption discussion has a connection to Veselnitskaya's work opposing the Magnitsky Act, a US law imposing sanctions on those involved in the death of Sergei Magnitsky — who died in a Russian prison after exposing financial fraud. After the law was passed, Russia retaliated by halting American adoptions of Russian children. Veselnitskaya questions the underlying story, and has been seeking to get the law changed. In both New York Times stories, however, Trump Jr. only spoke of being asked to attend the meeting by "an acquaintance." In a statement provided to BuzzFeed News, Trump Jr. said the acquaintance was someone he got to know during the 2013 Miss Universe pageant, which took place in Moscow. Later Sunday, the Washington Post reported that Rob Goldstone — a music publicist — told the Post that he was that acquaintance. Trump Jr. said the acquaintance attended the June 9, 2016, meeting — which Goldstone told the Post is the case. So, how did this meeting come about and what happened during it? A lot is still unknown or unclear, stories were even shifting over the weekend, and Goldstone did not respond to repeated requests to talk with BuzzFeed News about the situation. Here's what we do know. Goldstone did marketing for HMV Records through 1998, when the British-based company began downsizing. That led him to start Oui 2 Entertainment, according to Billboard. Goldstone and Oui 2 represent Emin Agalarov, a musician whose father, Aras Agalarov, is a prominent developer worth nearly $2 billion, according to Forbes. On Monday, Goldstone confirmed to the Associated Press and the Washington Post that he set up the meeting on behalf of Emin. The Agalarov family also has a history with Donald Trump, having successfully worked with him to bring the 2013 Miss Universe pageant to Moscow. Emin performed at the pageant that year, and Trump appeared in one of Emin's music videos around that time. In addition to his singing career, Emin serves as the first vice president of the Crocus Group, Aras Agalarov's development company. During the Miss Universe pageant, Aras and Trump had discussed the possibility of going into business together on "TRUMP TOWER-MOSCOW" as Trump tweeted at the time. A request for comment from Crocus Group was not immediately returned. Oui 2, run by Goldstone and David Wilson, helped with the pageant. A friend even teased Goldstone over how long he had been working in Russia in the run-up period to the pageant. Fast-forward to 2015, and Goldstone's company was heavily promoting Emin. Goldstone, a heavy traveler, often goes to the places where Emin is performing. In November 2015, the company wished Emin's father a happy birthday — highlighting a photograph of Aras with Vladimir Putin and another of Aras with Donald Trump. On Sunday evening, Oui 2 Entertainment locked its Twitter account, but not before BuzzFeed News captured most of the company's tweets. 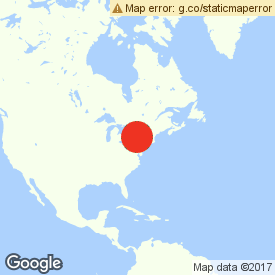 ...and checked into the Trump Organization on Fifth Avenue in New York City (despite the Jakarta notation on Facebook) on June 9 — the day of the meeting in question. The next Monday, the Oui 2 Entertainment Twitter account, which hadn't tweeted since December 2015, began tweeting again. ...and then a week later from New York City. By mid-July, Goldstone was back in Moscow, part of a three-week trip overseas. Of course, four months later, Trump did win the presidential election. This was Goldstone's post the night of the election. While it's not apparently a photograph from Election Day, it is a photograph that shows Goldstone, Emin, and Donald Trump at a table together. 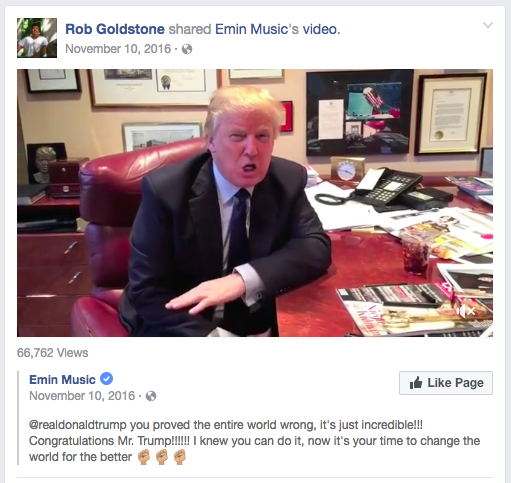 The next day, Goldstone celebrated — by referencing the Emin music video in which Trump appeared. 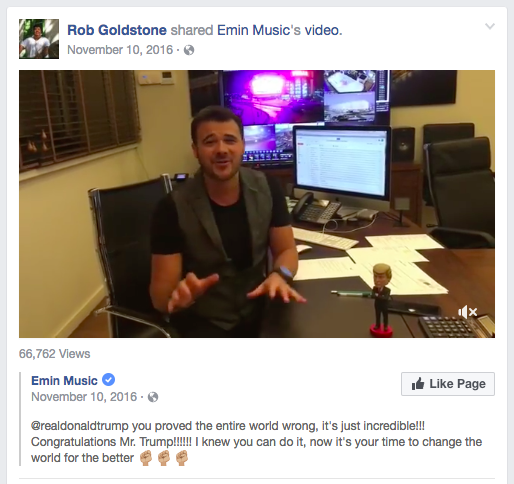 The day after that, Goldstone shared Emin's own video congratulating Trump on his win.